There is a concept in licensing law called reciprocity. So in the licensing context, it means that a person who holds a professional or trade license in one state — a doctor, for example, or an electrician — can practice his profession or trade in another state, as long as that other state will let the first state’s licensees practice, too. You can see it in the laws of the states way back in American history. And perhaps nowhere as bluntly as in the Acts of the General Assembly of Kentucky, passed at its 1808-09 session, in a law The Legal Genealogist stumbled across last night in reviewing laws for this weekend’s upcoming Family History Seminar and Book Fair sponsored by the Louisville Genealogical Society. And it’s clear the two new kids in the statehood sandbox were not playing as nicely together as they might. It’s even clearer that it was — sigh — the lawyers who were throwing sand at each other. It was that law in particular that, apparently, was what triggered Kentucky’s response in 1809. 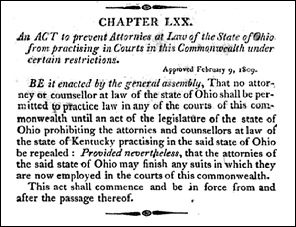 If Ohio was going to limit law practice to its citizens, well, then, its citizens couldn’t practice in Kentucky, by gorry. Which is why when I’m asked, as I so often am, what the rules were about attorney admission back in the 19th century, I give my standard answer.